A few months ago I consulted with Lydia Hiby, an animal communicator, with the hopes of getting some long-awaited answers about Quest’s hyper-reactive behavior. Unfortunately, I am no closer to understanding Quest than I was before. I had truly hoped that Ms. Hiby would provide me with significant information, the missing puzzle piece, that would shed light on Quest’s behavior, but that did not happen. Ms. Hiby’s recommendation of herbal remedies for Quest’s issues was something that I had not anticipated, but worthy of consideration. I had some knowledge of valerian from my ongoing research about canine anxiety, but was unfamiliar with milk thistle. I wasted no time investigating that particular herb. According to the Whole Dog Journal, milk thistle is “best reserved as a treatment for existing liver disease, rather than being used by itself in a healthy dog.” The article goes on to state that long-term ingestion of very high doses will eventually suppress liver function. Well, that is problematic. First, I do not believe that Quest has liver disease. Although Ms. Hiby felt that Quest’s liver is “out of balance”, that does not mean that Quest has anything physically wrong with her liver. With no symptoms, I cannot bring myself to schedule a veterinarian appointment for Quest and ask the doctor to check Quest’s liver based on an animal communicator’s intuition. Maybe I am more of a skeptic than I thought. Secondly, if I decided to have an open mind and give the milk thistle a try, without a veterinarian on board I would have no way of knowing the proper dosage to give a 6 lb. dog. Milk thistle was officially off the table. As for the valerian, I wanted to check with Quest’s veterinary behaviorist, Dr. Overall, and get her opinion. Since Quest was currently taking Gabapentin I knew that care must be used when combining herbal treatments with prescription medications. Dr. Overall informed me that she used to recommend valerian for anxious dogs years ago before today’s commonly used drugs were affordable, but she never saw the effect that is observed with pharmaceuticals. She added that a drawback to using herbal remedies, like valerian, is that we don’t know how much of the main ingredient is in any of these compounds. So, valerian was off the table, too. Although I did not feel that it was safe to follow Lydia’s advice about the homeopathic remedies, my conversation with her did prompt me to seek a change in Quest’s current medication. After consulting with Dr. Overall, Quest was weaned off of the Gabapentin and began Clomicalm(clomipramine). Clomicalm, like many pet medications, was adapted from a human drug. It is categorized as an SSRI(selective serotonin reuptake inhibitor), and similar to the human anti-depressant, Prozac. Quest was on the Clomicalm for a couple of months and exhibited the same level of anxiety that has always been present. Dr. Overall recommended increasing the dosage, but there was a conflict. 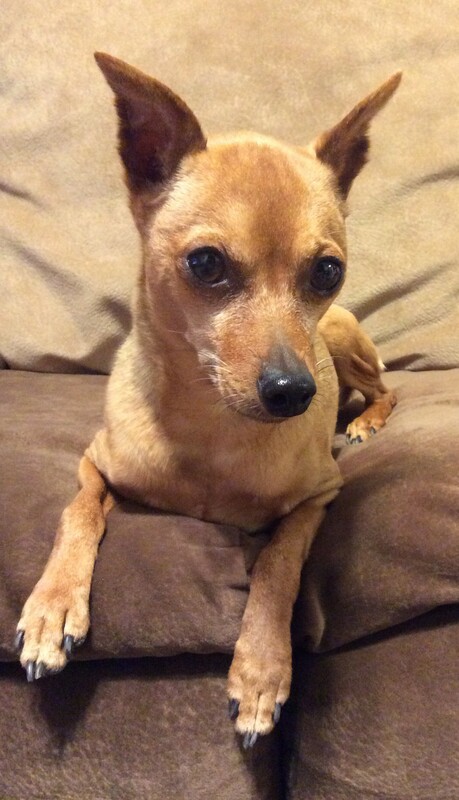 Quest was due for a dental cleaning which required anesthesia. Quest’s regular veterinarian was not comfortable performing the procedure while Quest was taking Clomicalm, even though Dr. Overall gave her approval. With safety being my top concern, I weaned Quest off of the Clomicalm so that she could have the dental cleaning. Quest has been drug free for over three months now. I decided to take a “wait and see” approach before beginning the Clomicalm again with the recommended dosage increase if needed, or asking about trying a different drug. Lately, I have heard Quest gritting her teeth, a sound I have not heard in a while, and have also noticed a bit more nibbling on her front legs. Sigh. It would be so much easier to make a decision if Quest could speak. I would ask her, “How is your anxiety?” “Was it better when you were taking medication?” “Which medication helped you the most?” “Please tell me what I should do.” Since Quest is unable to answer those questions it is up to me, and me alone, to decide how to proceed. One-third of my dogs are normal. 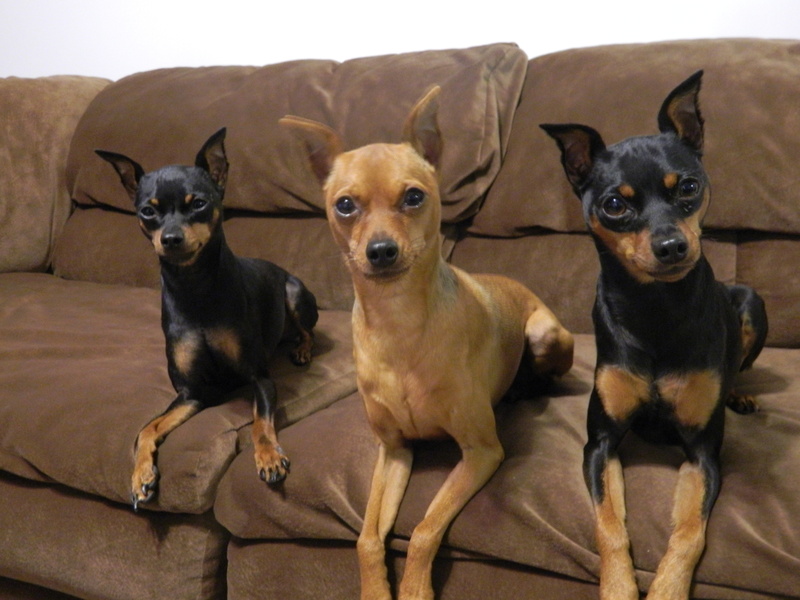 No, I do not have a houseful of crazy canines, just three. Well, make that two, because I recently learned that one of them is normal. I did not know that Malibu was normal until Dr. Overall, a veterinary behaviorist, informed me of the surprising news. Not only is Malibu normal, she may be “both valuable and not as common as people think”. After observing my Min Pins for several hours, Dr. Overall confirmed Quest’s prior diagnosis of social phobia. She also had the opportunity to witness Aspen’s aggression towards Malibu, the primary reason for our consultation. Between Quest and Aspen’s theatrics, Malibu presented herself as the most normal dog in the room. Additionally, upon witnessing Malibu’s interactions with Aspen, Dr. Overall deemed Malibu to be a “contextually appropriate dog who does a very good job of both reading signals and signaling appropriately.” Evidently, those abilities do not come naturally to all dogs. Considering the fact that I had previously believed myself to be the pet parent of a three pack of crazy, I should have felt ecstatic. But instead of embracing this unexpected news, I focused on the reality of the situation. Malibu may appear normal in one capacity, but in many other ways she is definitely on the far side of normal. Malibu has her own issues that have plagued her from puppyhood. 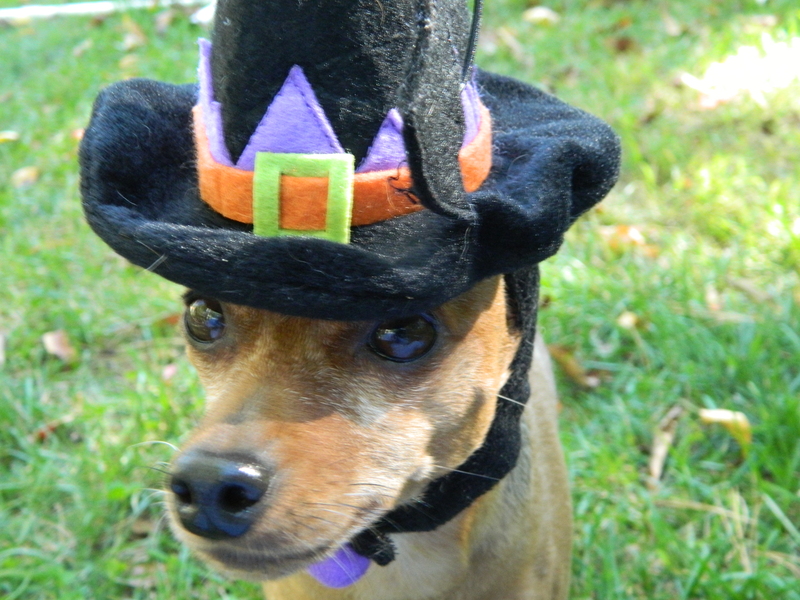 She can be quite reactive in certain situations and is the most timid of my three Min Pins. In fact, if you put my dogs in a line-up, I am not so sure that impartial observers would pick Malibu as the normal dog. They would not select Quest for obvious reasons, but they may believe that Aspen is the closest to normal out of the pack. Aside from her aggression towards Malibu, Aspen is pretty close to perfect. Sure, she has a penchant for barking sometimes, but it is usually manageable. Aspen is the most social of the three and adapts to new environments with ease. 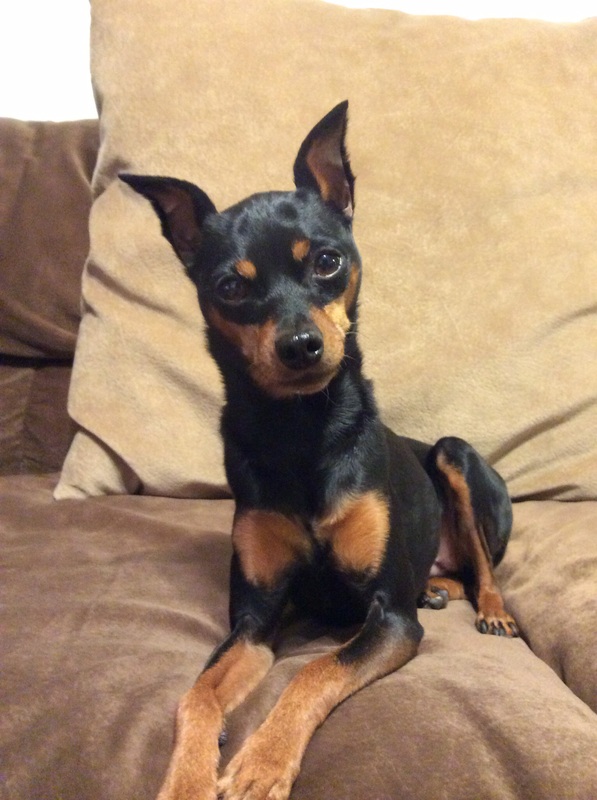 A realist, I know that my Min Pins may never be normal dogs and that is something that I have learned to accept. That does not mean that I have given up hope of rehabilitating my crew. My goals still include reducing my Min Pins’ reactivity, alleviating Quest’s fearfulness, and curbing Aspen’s aggression towards Malibu. Halloween is almost here and something wicked this way comes. The cackling of a witch is not what I hear, but a much more menacing sound. 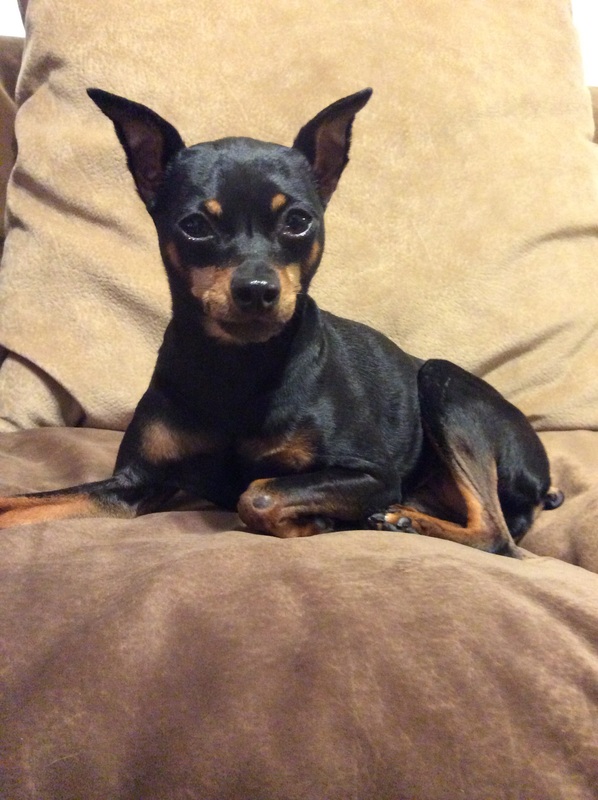 It is the growl of a Min Pin. Some may think it is cute when a tiny dog growls, but I can assure you that it is not. For it is often a precursor to more aggressive behavior. A growl was the first sign of inter-dog aggression in our home. I cannot remember exactly when I first heard this sound, but it was around the time of the pups’ first birthday. Aspen would growl at Malibu for no apparent reason. Sometimes it appeared to be resource guarding of toys or preferred seating, but other times it seemed totally random. 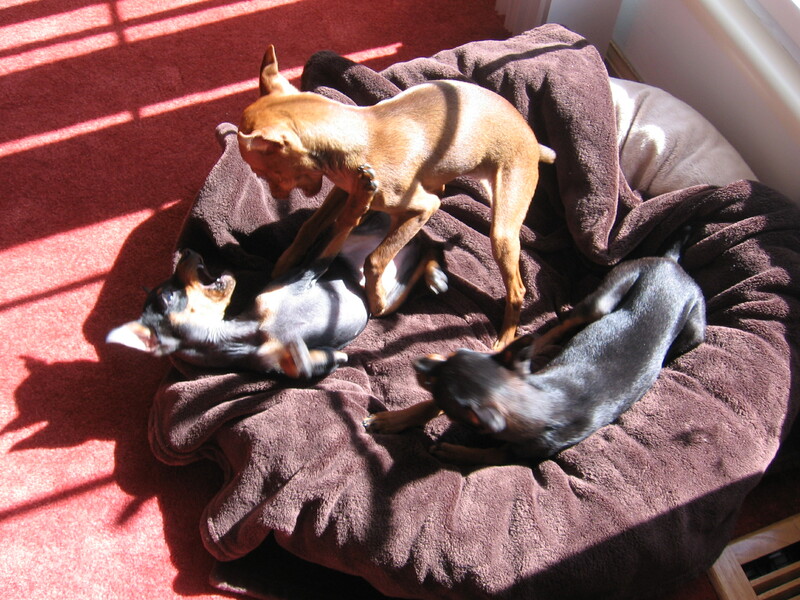 At three months – Playful pups, or a preview of future problems? For the first few years, that is all it was, growling. Over time, Aspen’s growling transitioned to lunging and pouncing on Malibu. Trying to protect herself from an attack, Malibu will shake Aspen off of her back. Then the two of them will be standing on their hind legs in a face-to-face scuffle. The entire episode, from start to finish, lasts less than ten seconds. Fortunately, this scenario is not a regular occurrence, and I am hoping that it never becomes one. When Aspen began showing aggression towards Malibu, unsolicited advice given to me early on with the pups began creeping back into my thoughts. Seeking information about mouthy puppies, I had visited several online forums shortly after bringing the pups home. The mouthing was not addressed at all; instead I was warned about aggression among female littermates and encouraged to rehome two of the puppies. I was told that female littermates have a tendency to fight, and that those fights can be brutal, even deadly. Desperate for advice on inter-dog aggression, I scheduled an appointment with a vet behaviorist. I decided against returning to Tufts University, where I had taken Quest for her hyper-reactivity, when I learned that another highly-regarded behaviorist was only a couple of hours away. In early summer of 2014, I took my entire crew to meet with veterinary behaviorist, Dr. Karen Overall. 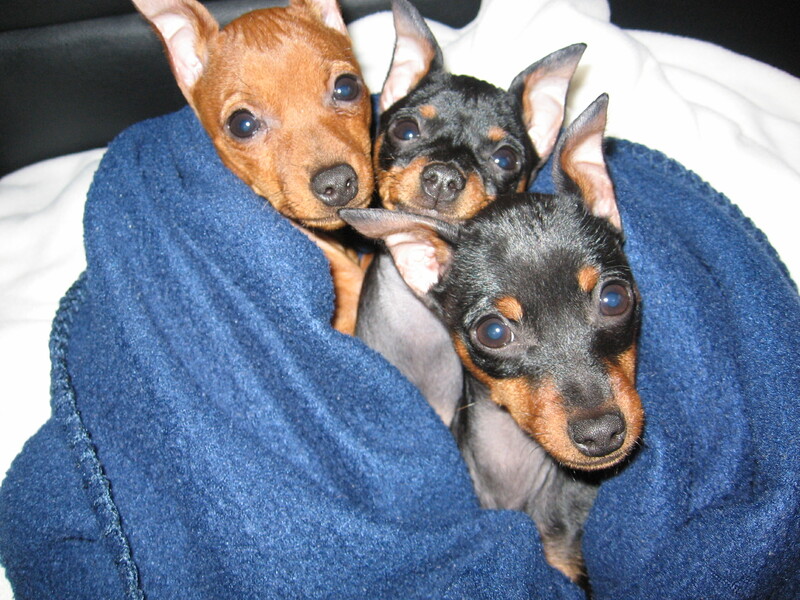 My Min Pins were six years old at the time of our visit. Prior to our consultation, I was required to complete a lengthy survey and submit videos of our home environment, daily routines, and, if possible, the problem behavior. A clear representation of Aspen’s behavior towards Malibu was captured, providing Dr. Overall with solid evidence of the drama that unfolds inside of our home. Dr. Overall relieved me when she added, “Since Aspen’s behavior has remained the same over the past few years, and not escalated to more serious aggression, it most likely will not worsen over time.” Of course, there are no certainties, but I did feel better after hearing Dr. Overall’s view on future episodes of inter-dog aggression in our home. I was not surprised that Dr. Overall felt that both Aspen and Quest would benefit from medication. Gabapentin was prescribed for Quest and Fluoxetine for Aspen. Several adjustments have been made over the last couple of months. Trazodone was added for Quest and seems to be helping her. I will update Quest’s progress in a future post. After being on the Fluoxetine for a little over two months, I weaned Aspen off when I saw no improvement in her behavior. She then began taking Trazodone which helped less, making me realize that the Fluoxetine may have been working. Aspen is now taking both Fluoxetine and Trazodone. It is too soon to know if this combination of drugs will help, but I have learned to take things one day at a time. Shortly after our consultation, I received a detailed plan that included a diagnostic summary for each dog, medication information, highlights of our discussions, protocols for behavior modification and relaxation, and much more. This plan has become my handbook as it is now an essential component in the rehabilitation of my dogs. Dr. Overall continues to oversee the well-being of my dogs. No drug or dosage change is made without her guidance. Dr. Overall also views the videos that I send and responds promptly with a detailed behavioral analysis. This feedback helps keep my dogs’ progress on track and headed in the right direction. Protocols for deference, breathing and relaxation, programs created by Dr. Overall, were included in the plan for my three dogs. The goal of these protocols is to create calmer, more relaxed dogs by teaching them that they have some control over their reactivity. Other protocols focus on inter-dog aggression, “special-needs” pets and behavioral medication. It has not been easy fitting these programs into an already hectic schedule, but I am in it for the long haul. These programs will be practiced with my Min Pins for years to come. Dealing with my crew’s reactive behavior has been a walk in the park compared to handling inter-dog aggression in our home. To a degree, reactivity can be managed by avoiding certain places or situations. Further, through various channels, I have learned how to handle my reactive dogs. It continues to be challenging, but I have gotten a lot of hands-on experience over the past few years. Inter-dog aggression is a complicated problem with no easy answers or quick fixes. I cannot explain why Aspen is aggressive towards Malibu, and will probably never know the cause of her behavior. Dr. Overall feels that it may be genetic or due to environmental stress that was placed on the litter in their first few weeks of life. When I look at Aspen, I don’t see a “bad” dog. I see a sweet, affectionate dog who, for lack of a better expression, is unbalanced in some capacity through no fault of her own. I remain hopeful that medication will help decrease, or even eliminate, Aspen’s aggression towards Malibu. Whatever the outcome, I am dedicated to helping Aspen learn how to control her impulses and confrontational behavior. Almost 5 yrs. old – Not snuggling anymore, but willing to sit close together. At three months – I loved how the crew would snuggle together as only puppies do.